June, 1565: Master ninja Hiro Hattori receives a pre-dawn visit from Kazu, a fellow shinobi working undercover at the shogunate. Hours before, the shogun''s cousin, Saburo, was stabbed to death in the shogun's palace. The murder weapon: Kazu's personal dagger. Kazu says he's innocent, and begs for Hiro's help, but his story gives Hiro reason to doubt the young shinobi's claims. When the shogun summons Hiro and Father Mateo, the Portuguese Jesuit priest under Hiro's protection, to find the killer, Hiro finds himself forced to choose between friendship and personal honor. The investigation reveals a plot to assassinate the shogun and overthrow the ruling Ashikaga clan. With Lord Oda's enemy forces approaching Kyoto, and the murderer poised to strike again, Hiro must use his assassin's skills to reveal the killer's identity and protect the shogun at any cost. Kazu, now trapped in the city, still refuses to explain his whereabouts at the time of the murder. But a suspicious shogunate maid, Saburo's wife, and the shogun's stable master also had reasons to want Saburo dead. With the shogun demanding the murderer's head before Lord Oda reaches the city, Hiro and Father Mateo must produce the killer in time . . . or die in his place. 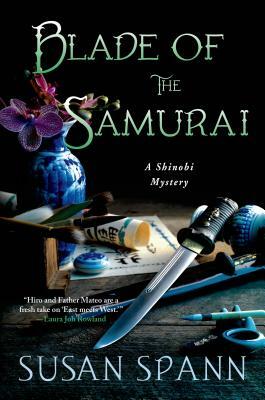 Susan Spann's Blade of the Samurai is a complex mystery that will transport readers to a thrilling and unforgettable adventure in sixteenth-century Japan. SUSAN SPANN is a transactional attorney focusing on publishing law and a former law school professor. She has a deep interest in Asian culture and has studied Mandarin and Japanese. Her hobbies include Asian cooking, fencing, knife and shuriken throwing, traditional archery, martial arts, rock climbing, and horseback riding. Susan keeps a marine aquarium where she raises seahorses and rare corals. Spann is a member of the Historical Novel Society and is the author of Claws of the Cat. She lives in northern California with her family.